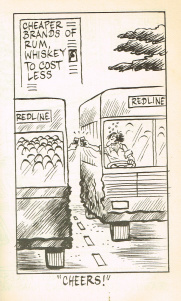 Whether it is the realm of politics, home affairs, civic issues or public transport, Sudhir Dar’s cartoons continue to regale us with their tongue-in-cheek humour. 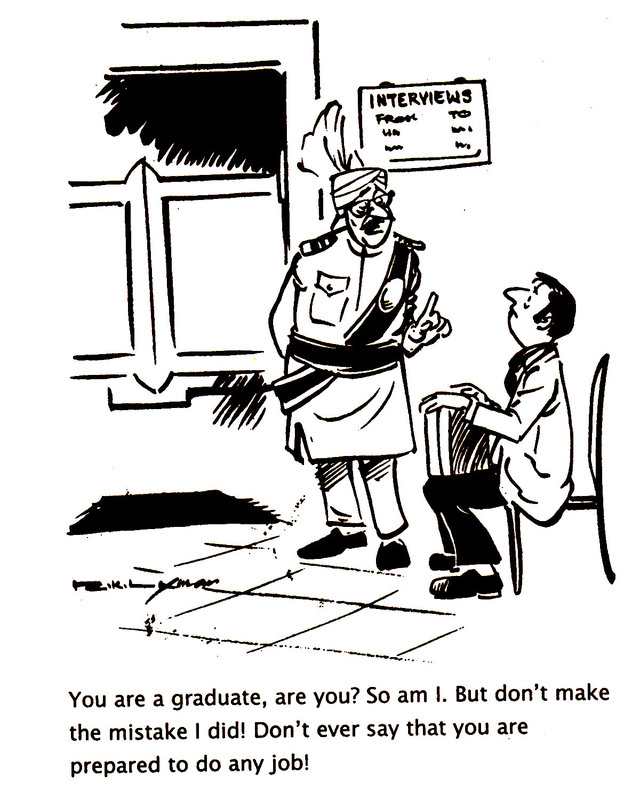 Denizens of Delhi would surely relate to these works of art better. But the underlying messages happen to be global in nature. 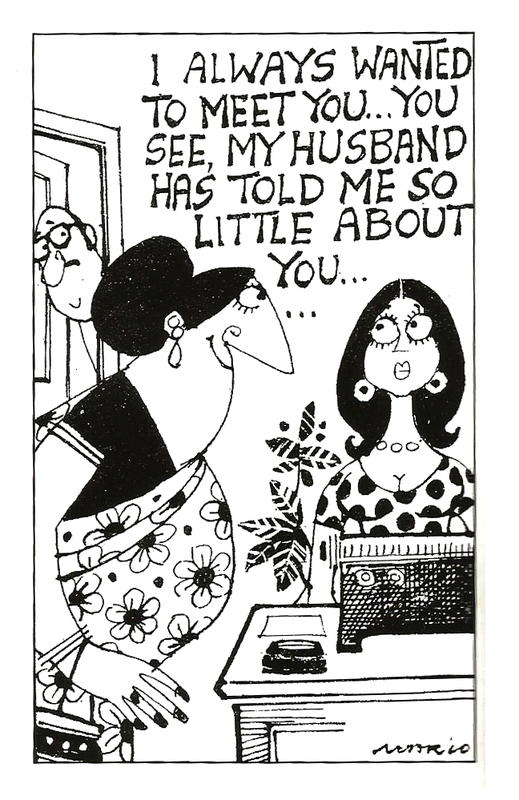 The likes of Sudhir Dar, R K Laxman, Mario Miranda and Shankar have always managed to keep us amused with their timely and witty cartoons. 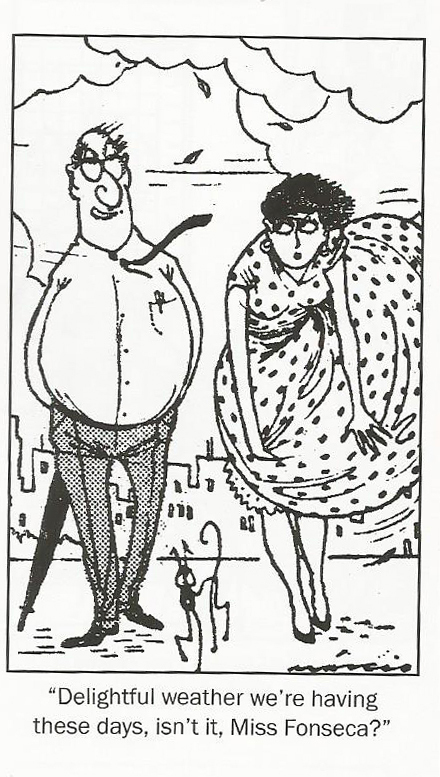 But for them, and but for authors like P G Wodehouse, our lives would be so very dull and dreary. 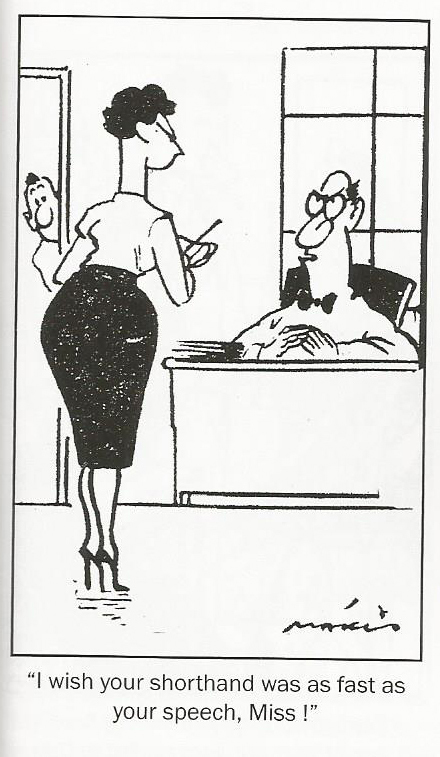 Once upon a time, behind every successful senior manager or CEO, there used to be a secretary. Without a secretary fussing over them, the best of bosses would collapse. Their performance ratings would drop. Meetings, appointments, conference calls, travel plans, grapevine management, appointments, appraisals, promotions – there was virtually no activity in a company which fell outside the circle of influence of this omniscient and omnipotent tribe. Lesser mortals would invariably strive to always remain in the good books of the members of this species. Over time, this species appears to have joined the ranks of such endangered ones as those of tigers, rhinos and panthers. The smart ones have managed to get kicked upwards and have assumed operational roles. The not-so-smart ones have gravitated towards the unalloyed bliss of handling some mundane chores. The dull ones have simply been asked to pack their bags and seek greener pastures elsewhere. 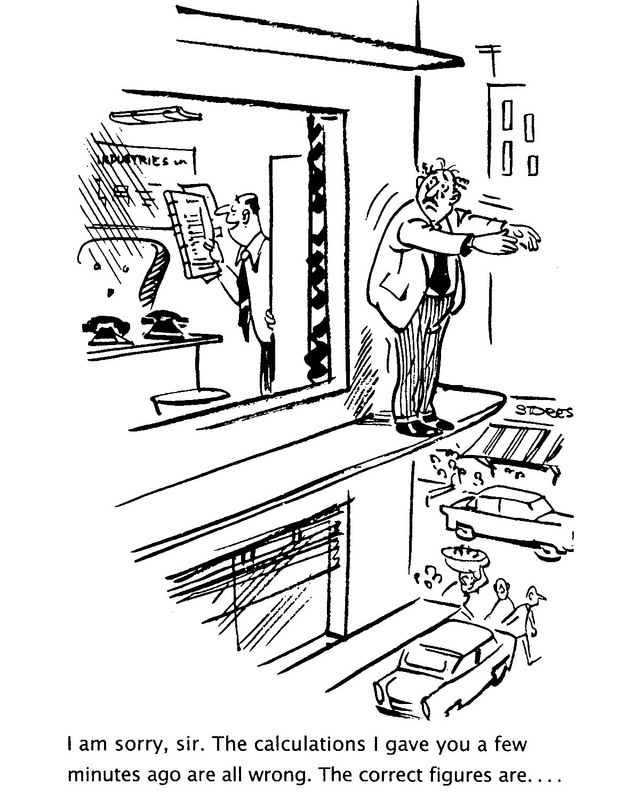 CEOs and managers wanting to puncture the stress bubble these days have several options. Some can head to the nearest gym and burn away those blues. Some can simply switch off their technical gizmos and spend some quality time with their loved ones. Some can start learning yoga and meditation. Some can choose to put off the lights at home, put on some soothing music and relish their favourite tissue restorative, sans any distraction. Others can pick up any work of P G Wodehouse or Terry Pratchett and recharge their batteries. 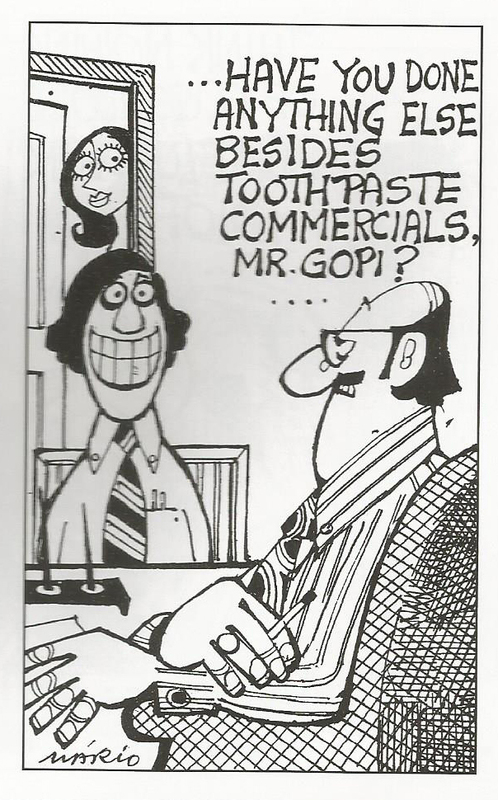 Or, they can look up the delightful work of such eminent cartoonists as R K Laxman and Mario Miranda, both of whom have looked at managerial situations with the lens of sparkling wit and humour. 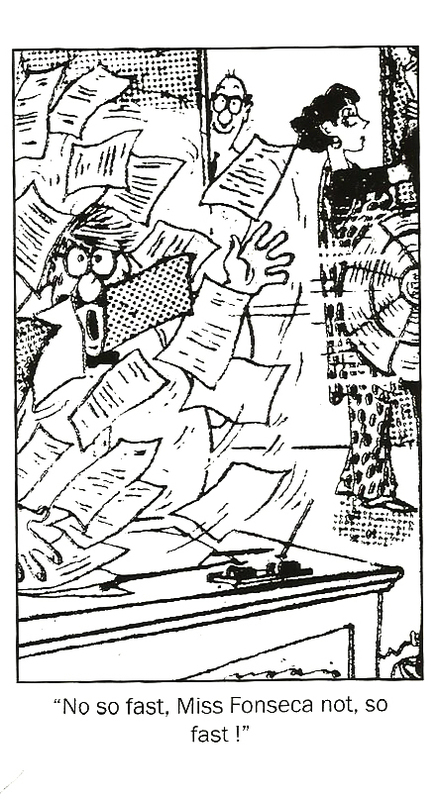 If there is any evidence of actionable sustainability for the secretarial species of our corporate world, it comes in the form of writers, illustrators and cartoonists. 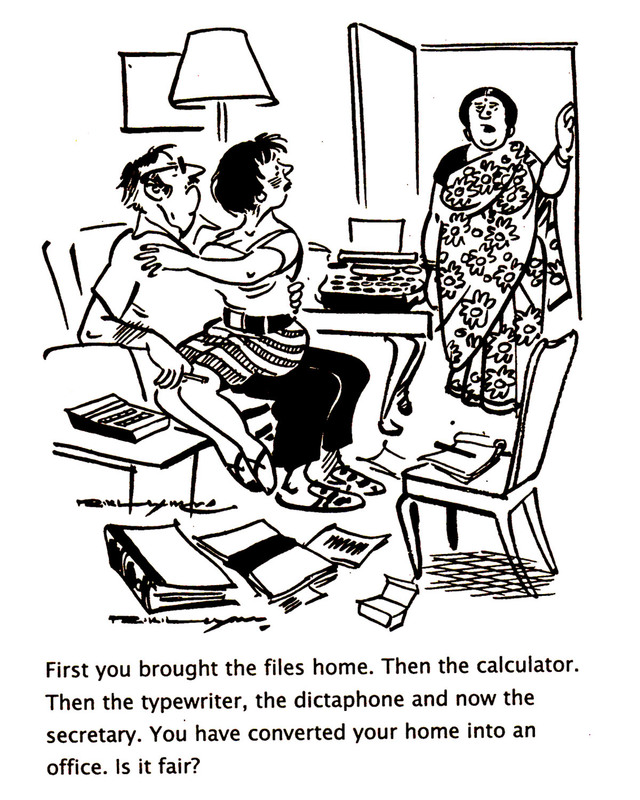 Writers like P G Wodehouse have envisioned characters in the secretarial mould. The Goofiness Quotient of such characters continues to give millions of fans the hope that the imprints of this tribe on the sands of time never get washed away. 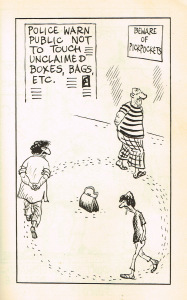 Eminent artists like R K Laxman and Mario Miranda have breathed visual life into the members of this species. This has ensured that they continue to remain enshrined in our collective psyche for posterity. In the works of P G Wodehouse, we come across Rupert Baxter, the efficient secretary of Lord Emsworth. When at Blandings Castle, we also run into the suave Rupert Psmith and the conscientious Eve Halliday. When in the company of Lord Marshmoreton, we meet Alice Faraday. Julia Ukridge has a secretary by the name of Dora Mason. 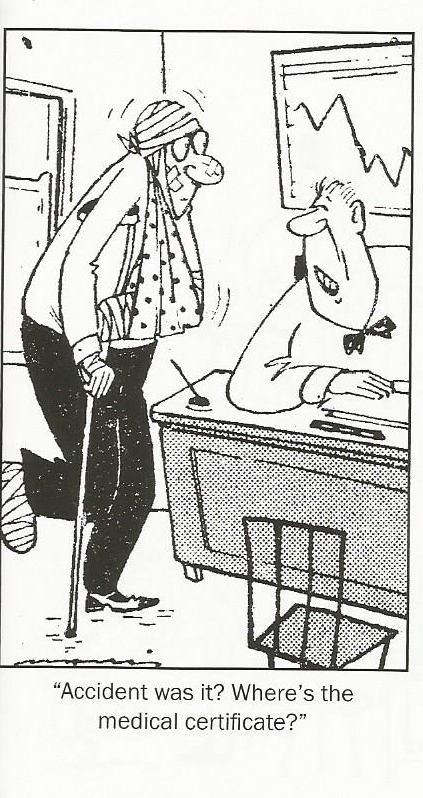 Aunt Agatha’s plans to get Bertie Wooster to take up the role of a secretary to the Cabinet Minister, A. B. Filmer, get thwarted by the acts of an angry swan. 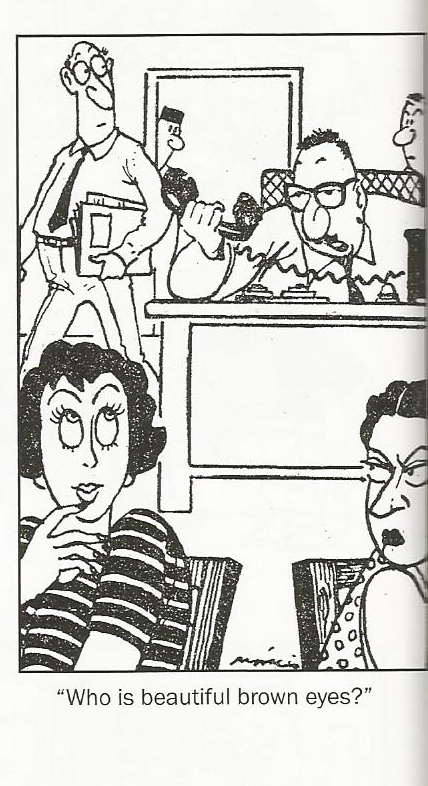 Detailed profiles of these characters, as well as their juicy escapades, deserve a closer scrutiny in a future post. 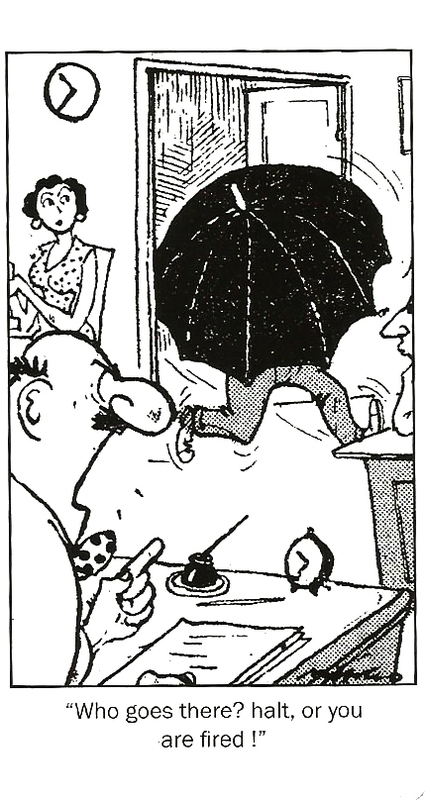 To Mario Miranda goes the credit of having etched out a truly memorable character in his works. 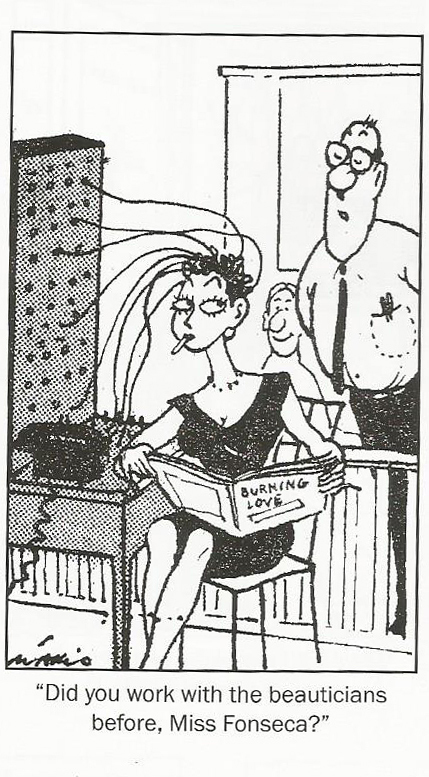 Who can forget the buxom but woolly-headed Miss Fonseca? Besides being a Weapon of Mass Distraction, her job is full of challenges. She has to make sense out of whatever The Boss mumbles in the course of dictating a letter. She has to re-do letters all the times, because The Boss keeps changing his mind with each draft that she prepares. Every time she crosses her legs, The Boss gets distracted. There are times when her presence in the office becomes a hindrance to work. The poor soul is expected to manage all kinds of advances, irrespective of the hierarchical level of the predator on prowl. She has to take some inappropriate comments in her stride. 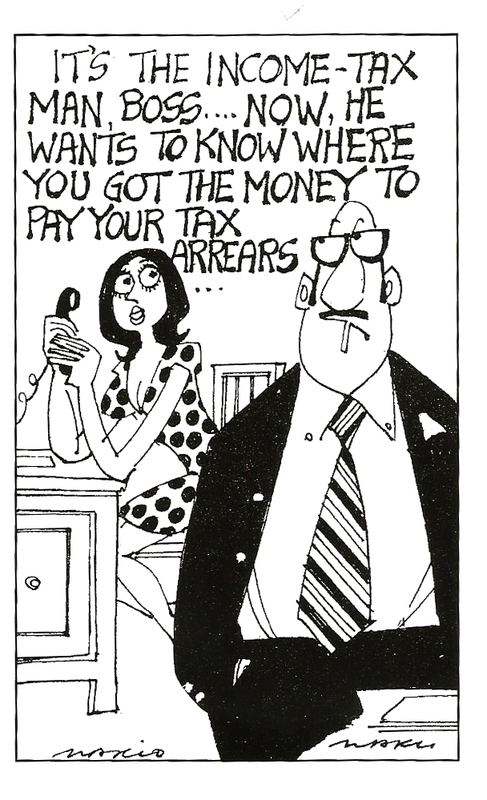 She has to handle obnoxious calls from the Income Tax department. 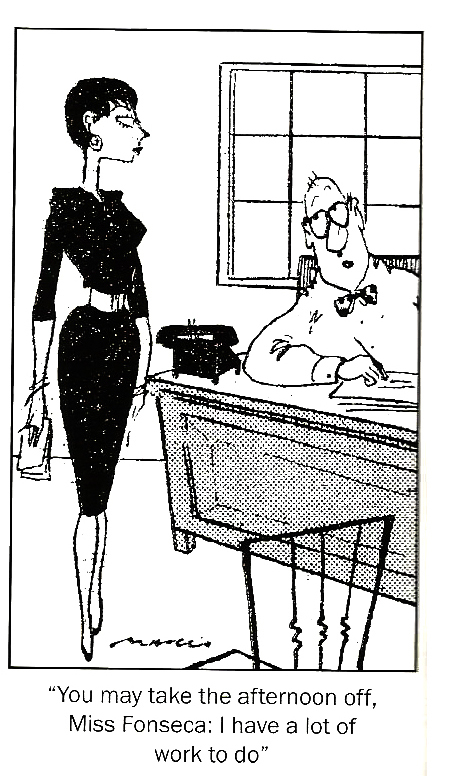 She even has to face an irate spouse of The Boss. 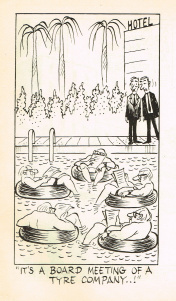 Here are a few snippets from the portfolio of Mario Miranda which continue to amuse, entertain and educate all managers. 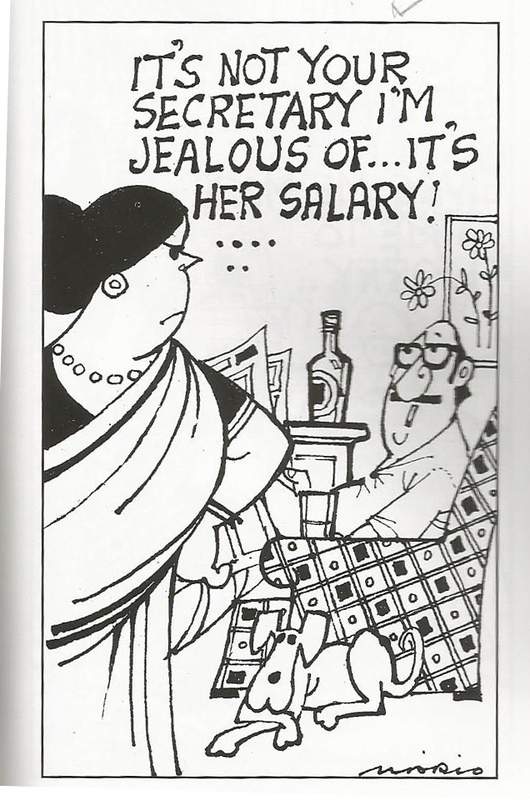 Here are two cartoons of the master of the art, R K Laxman. 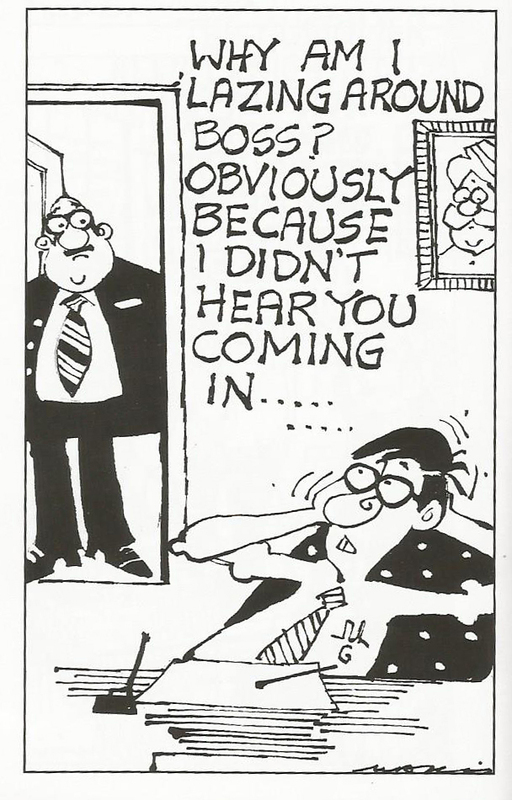 These demonstrate that even The Boss faces challenges in having a secretary around. If he takes one home, he is doomed. If he ends up marrying one, he suffers all the more. Much like dinosaurs, which got wiped out from the face of our planet, the tribe of secretaries has also got all but banished from the office space. However, it would be wrong to surmise that this species has become completely extinct in the corporate planet most managers inhabit. 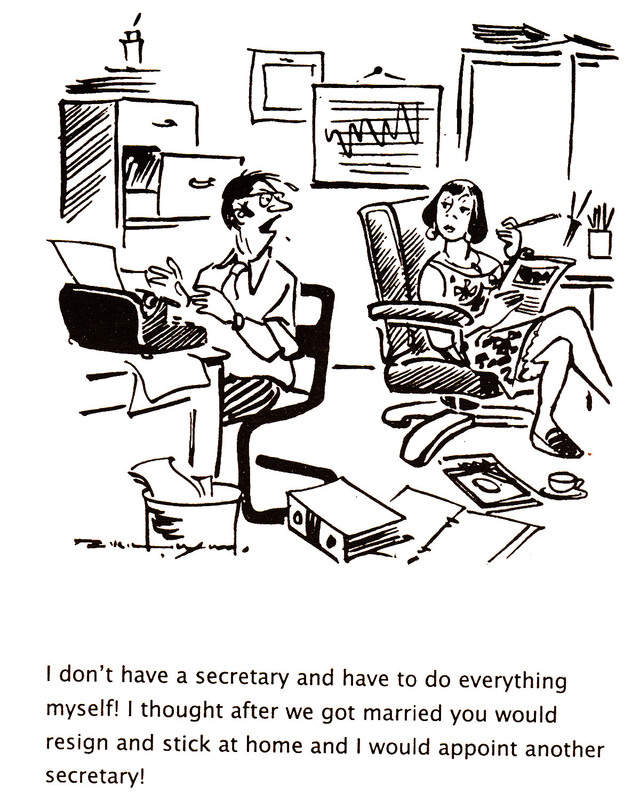 Advent of technology, changes in managerial styles and flatter hierarchies have merely made secretaries a rare breed. Those who have re-invented their portfolios have attained the next evolutionary stage of either an Executive Assistant or an Officer on Special Duty. 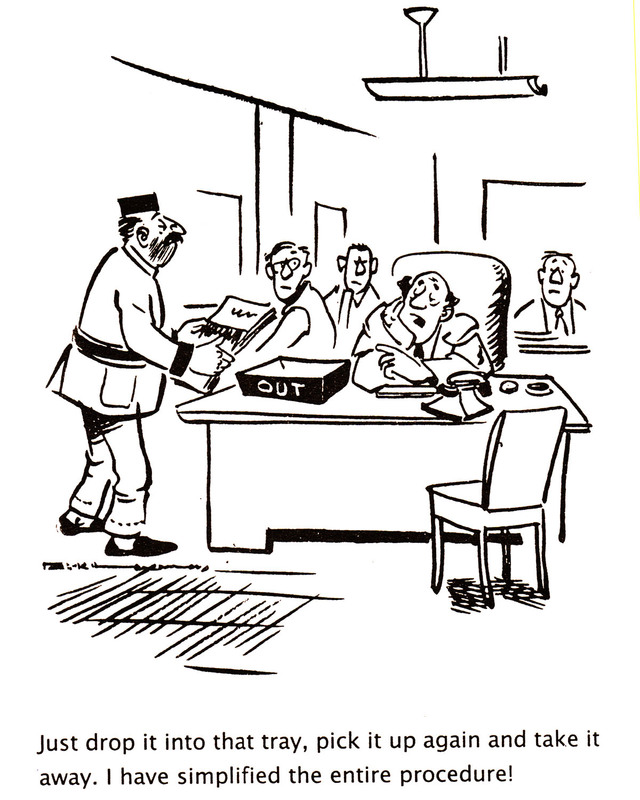 Others have simply got ‘promoted’, what with the luxury of having a secretary moving upwards, to the higher echelons of an organization. 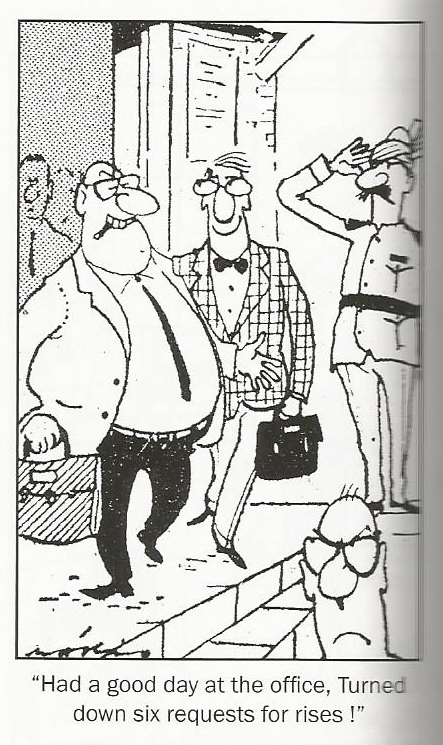 Thanks to such literary and artistic geniuses like P G Wodehouse, R K Laxman and Mario Miranda, to name only a few, secretaries shall never get wiped out as a species. Through their sparkling wit and humour, they shall live in our minds forever. 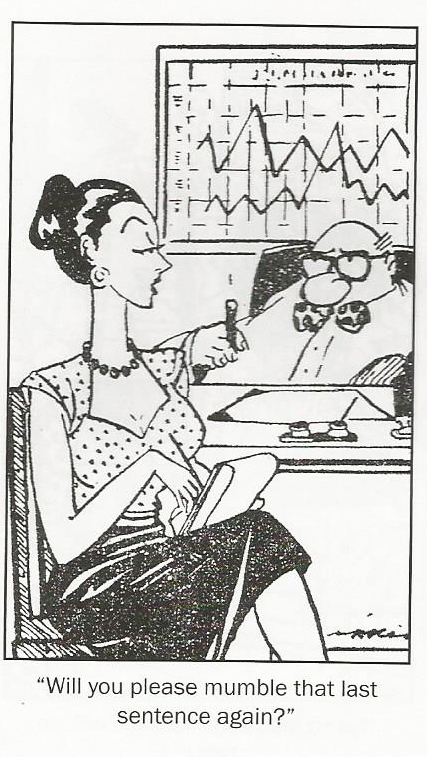 In Mario Miranda’s cartoons and illustrations, we come across the buxom but woolly headed secretary, Miss Fonseca. 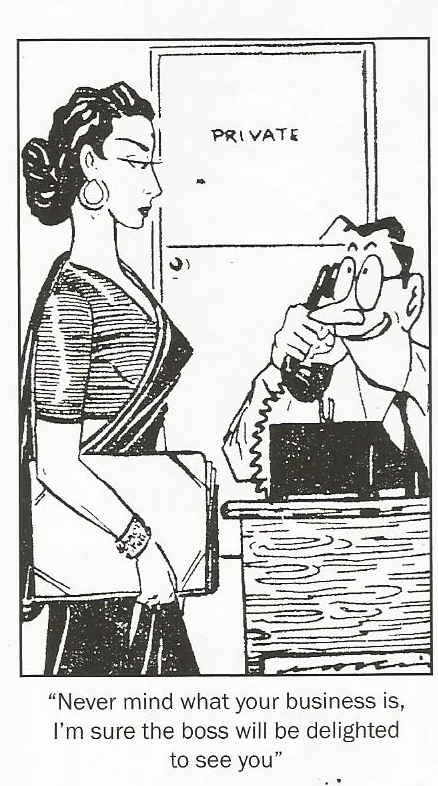 We also get to meet Mr. Godbole, the diffident and spineless manager, who is placed rather high in the hierarchy of goofy characters. And yes, no office scenario can be complete without a stiff-upper-lip superior, The Boss. He is the Lord and Master of all that he surveys. 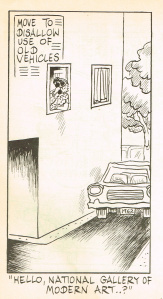 Here is a delectable sample of some of Mario Miranda’s great work. Each one has an in-built lesson for a manager, whether an aspiring one or a practising one! Not in a mood to work today? Think of an ingenious excuse to leave early. Or, just make a dash for it, hoping you remain invisible to The Boss. For those who have just joined the company, it is useful to interact with some old hands. 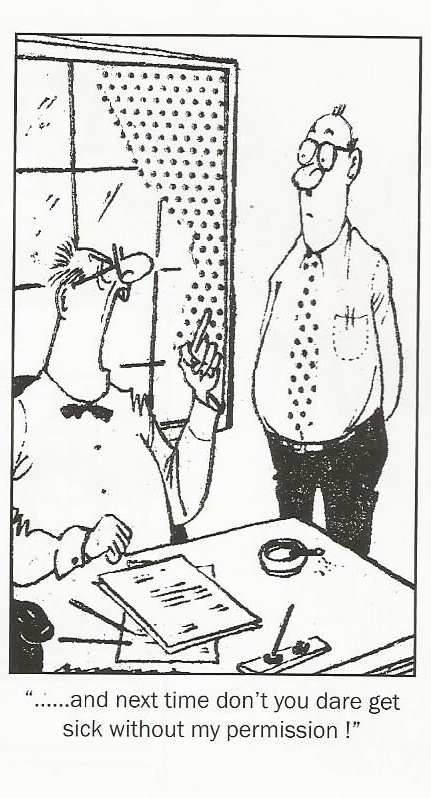 They could explain the finer points of the company’s leave policy. When hiring people, it is useful to enquire about their sleep patterns. 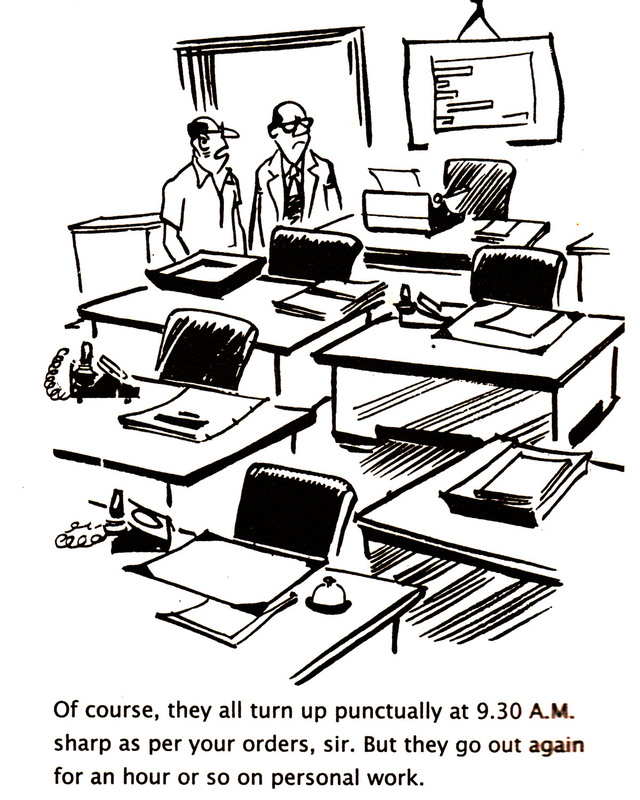 This ensures that when an employee is taking a power nap, The Boss’ blood pressure remains under control. Wish to report sick? 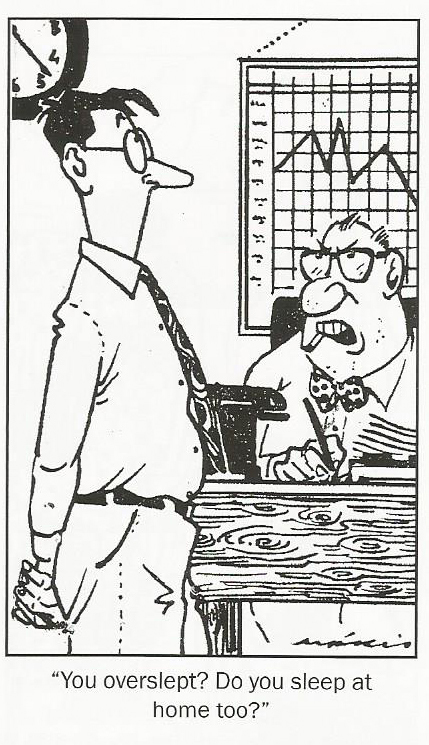 Better seek advance permission from The Boss! The Boss’ reputation travels far and wide. Those wanting to gate-crash into his office invariably use it to their advantage. Bosses can be forgiven for their blind spots. No office can run without those who have become a part of the landscape. 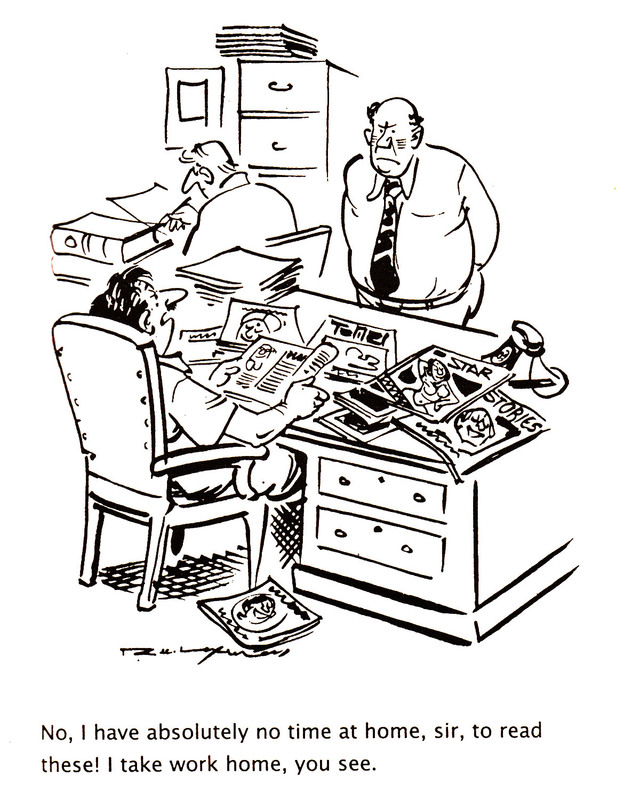 For blue-blooded bureaucrats, documentary evidence reigns supreme. 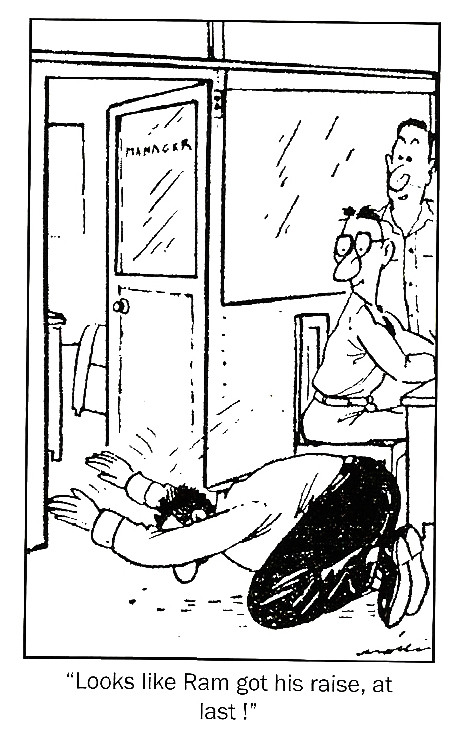 Employees often crawl into their place of work. Invariably, they run back home. Customers who happen to walk in at Closing Time get treated with as much derision as they deserve. 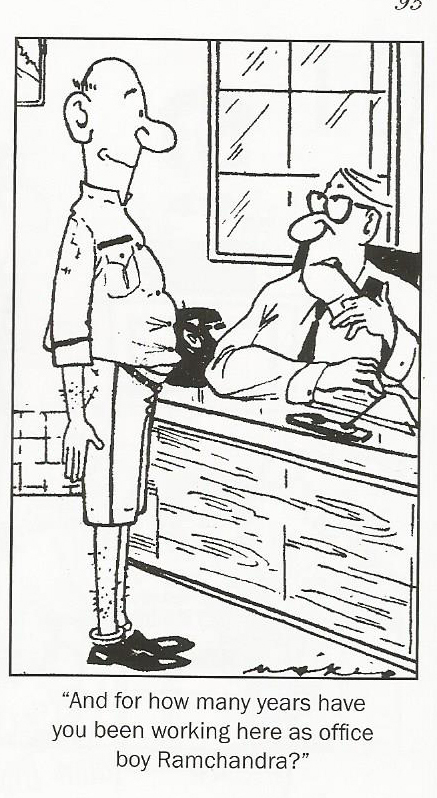 When selecting people, The Boss knows the importance of body language. Just joined a company? Befriend someone who can give you the inner dope on all colleagues. One way to keep The Boss happy is to allow him to refuse your request for a raise. 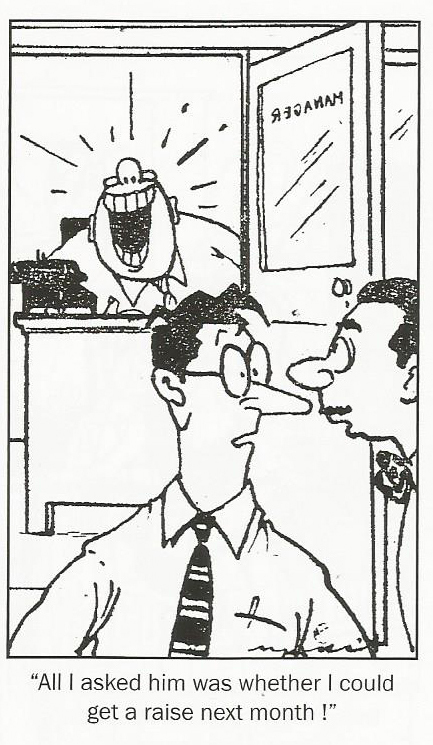 Yet another way to make The Boss laugh is to ask him for a raise! When a raise does come about, smart managers make sure they pay their obeisance to The Boss at regular intervals. Reporting late for work? 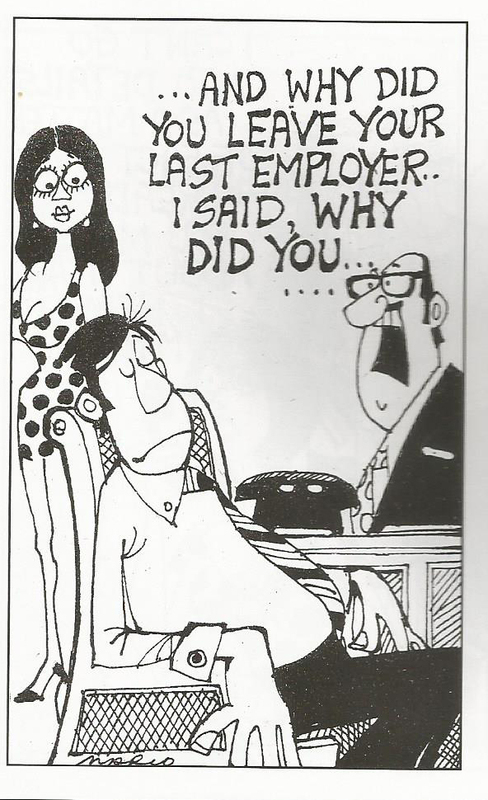 Think of a brand new excuse so as to escape The Boss’ wrath. 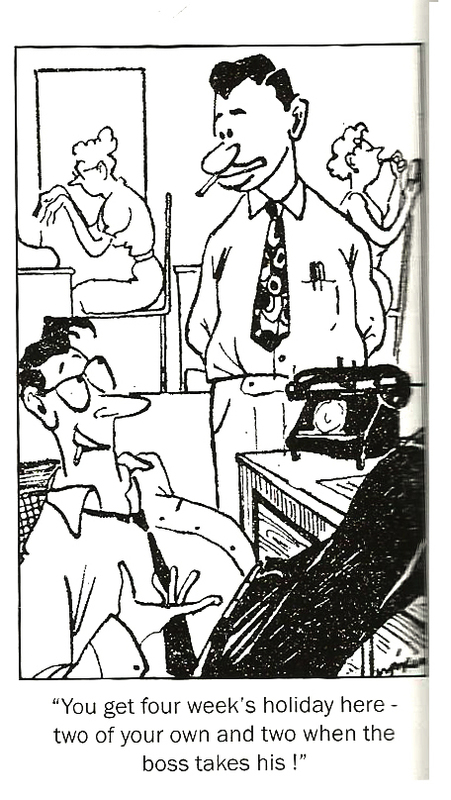 The Bosses always believe that physical activity of an employee is directly proportional to his/her real output at work. 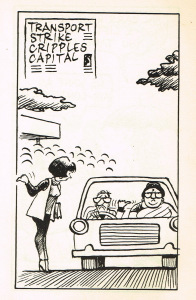 Mario Miranda’s cartoons not only entertain but also educate. To a stressed out manager, these are a ready means of chasing away those blues, much like a work of P G Wodehouse. 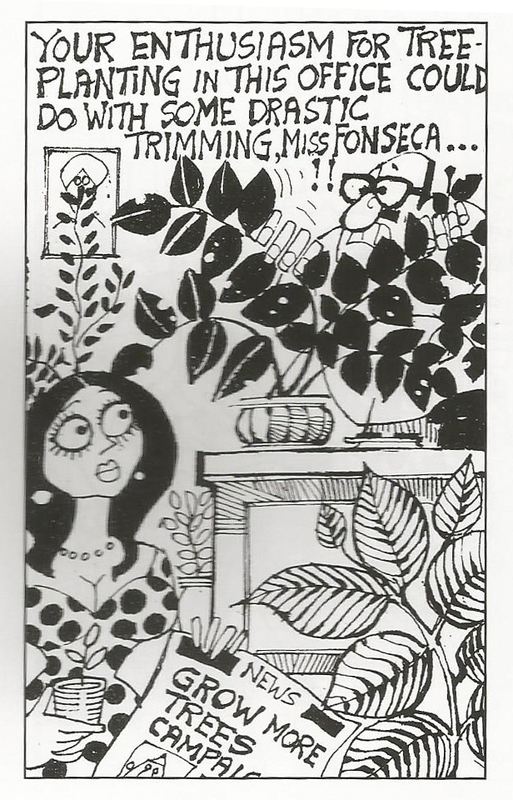 To Plum fans, Miss Fonseca might sound like Madeline Bassett. Mr Godbole, the average Joe, may appear to be configured along the lines of Bertie Wooster, without the brainy support of Jeeves. The Boss might sound as if he is built along the lines of Sir Watkyn Bassett. 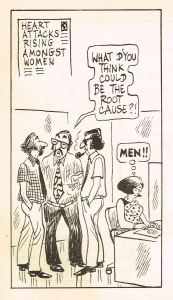 To aspiring managers, Mario Miranda’s cartoons offer unique insights into how companies function. They have a chance to learn how to navigate their way through the maze of management policies and practices, many of which are never covered in voluminous manuals and in Standard Operating Procedures of large conglomerates. 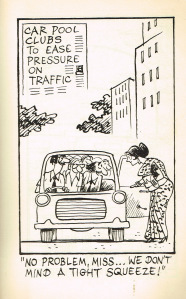 The management issues R K Laxman touches upon in his witty cartoons are wide-ranging. The messages are hard-hitting. For any manager who is trying to beat the blues, here is an effective anti-dote. 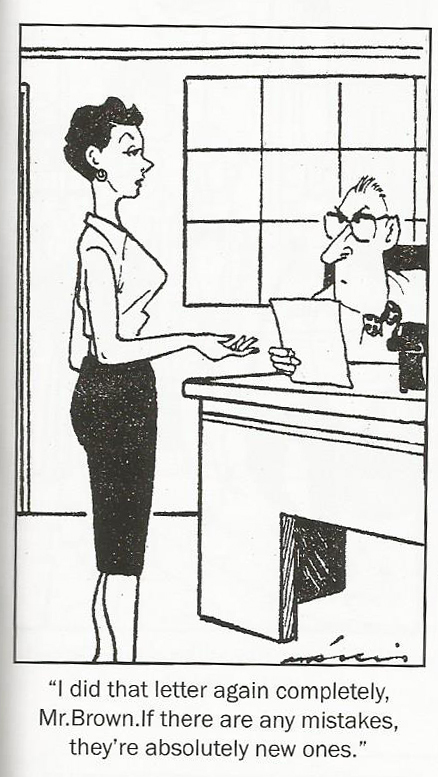 Caught reading naughty magazines in office? 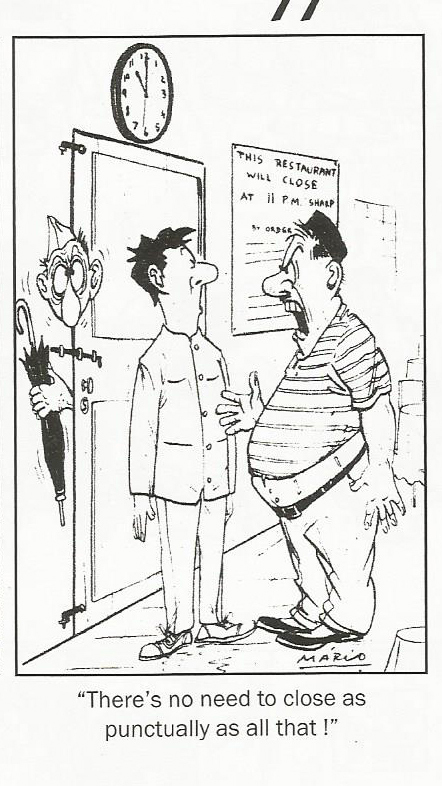 A manager’s life never has a dull moment. His/her career is like driving a crazy car which is always going either too fast or too slow. From the time a manager enters the n-dimensional space of his/her career space, till the time the boots/sandals are hung right and proper, a roller-coaster ride with uncertain twists and turns is the only certainty. To maintain one’s sanity, it helps to revisit the works of literary geniuses who have created an eternal world full of blooming flowers bathed in the soft glow of humor. For those amongst us who are fond of books, P G Wodehouse and Terry Pratchett are there to help us. 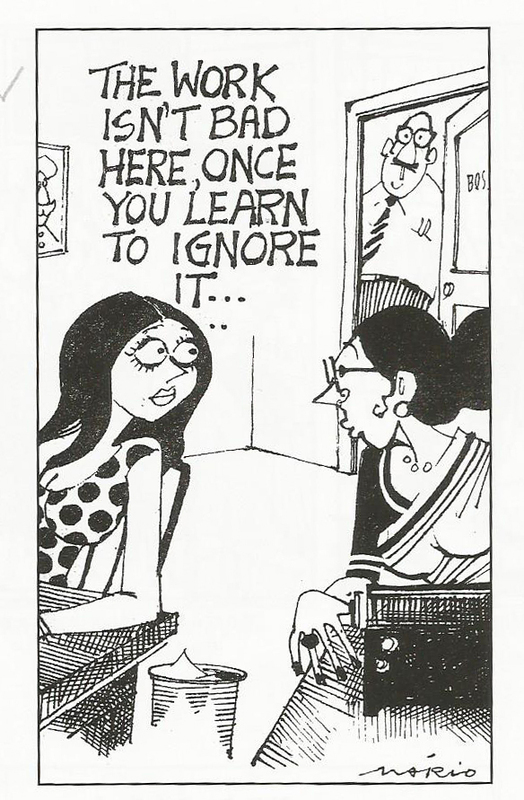 If we happen to like cartoons, Dilbert, Mario Miranda and R K Laxman are there to becalm our agitated minds!